Placencia, Belize - RUM POINT INN: 8.3 Acres of Prime Development Opportunity with 950' of Beach Front in the heart of Placencia, just north of the Placencia Airstrip. Rum Point Inn was built in 1974, and is one of the original resort developments in all of Placencia. With one of the most premier locations on all of the Placencia Peninsula, Rum Point Inn is famous for its personalized service and unique ambiance. It has been run by the Bevier family since opening in 1974. The land and improvements appraised for $8.2 million USD as of March 2010. 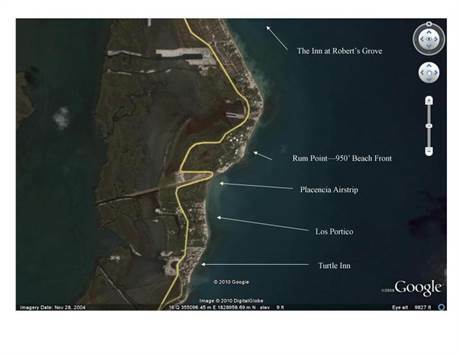 That is $4,737 per running foot of beach front (950') in the heart of Placencia. There is no comparable development parcel of this size in the heart of San Pedro Town, Ambergris Caye. Even a much smaller parcel in the heart of San Pedro Town would be expected to sell for no less than $10,000 per beach foot. This is a rare development opportunity to own 8.3 acres of beach front in such a prime location close to Turtle Inn, Placencia Airstrip, and the Inn at Robert's Grove. Appraisal provided upon Request.